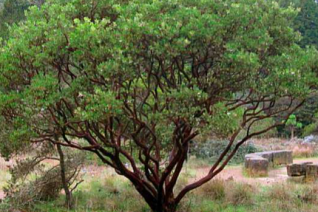 No other shrub is more symbolic of the Pacific Coast than Manzanita. From Baja to Canada one species or another is native from the coast to the mountains. Picturesque bark and familiar flowers make them great transitional shrubs from cultivated borders to wild areas. In the Pacific Northwest they are great echos for Madrones and are at home in a variety of landscapes. 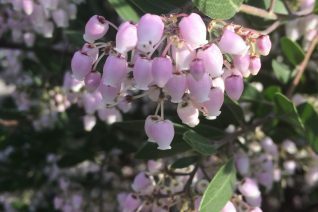 Pink to white urn-shaped flowers appear for a long time in late winter to spring and followed by copious amounts of small shiny fruit. 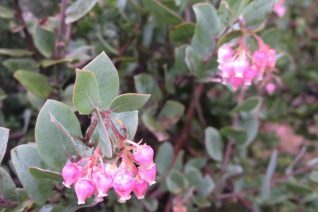 Manzanita is Spanish for “little apple” to which the fruit resemble. 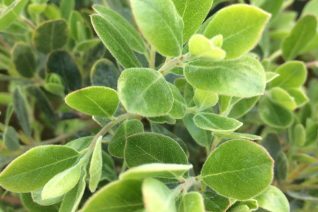 One reason they are such striking shrubs is that they hold their evergreen leaves perpendicular to the sun- an adaptation to avoid moisture loss. The myth that Manzanitas are difficult to cultivate most likely comes from the fact that they do not take well to regular summer irrigation. In a garden where summer watering is non-existent they are among the easiest and most handsome shrubs one can grow. They do best in acid soil on slopes with full sun and good air circulation. 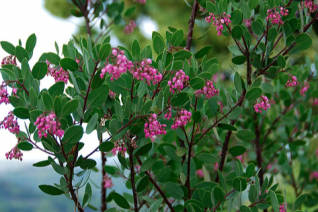 The best size to plant of a Manzanita is a 6″ or 1 gallon pot or a two gallon pot but no larger. The majority grow so incredibly fast that we find the smaller the better they establish. Large sizes are prone to wind rock which can afflict them if they do not develop a sufficient root system. 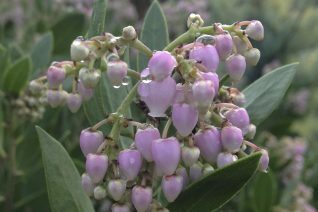 Arctostaphylos make excellent container subjects as long as the plant is not subject to overwatering. Many varieties will live happily in pots for years and will eventually develop gnarled, bonsai-like characteristics. Water when dry and in early spring apply a handful of all organic fertilizer around the roots. 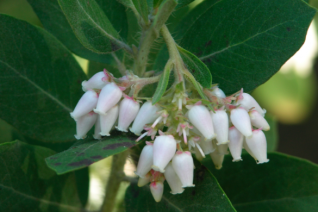 Arctostaphylos have many, many wiry roots meant to extract nutrients from a wide zone. Remember this when containerizing them. Large species can fill a pot with roots in just a year or two. Again, this requires annual fertilizer applications to maintain good health. Also, the restricted roots in containers means that the plant will grow quite a bit more reservedly than when it can stretch out in the ground. 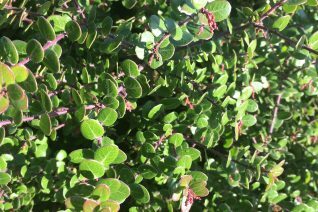 Pruning Arctostaphylos is very easy. To maintain a compact plant or to increase density simply tip prune new growth after it has emerged- after flowering has ended. Just tip off the few leaves at the end of each stem. For more radical pruning its important to understand that you can prune on current growth (with leaves) and it will resprout. Older wood without leaves (and probably peeling bark) will NOT sprout from dormant buds. There are none. This comes into play 3-4 years after establishment. Most pruning is done to eliminate dead or useless twigs around the base of the plant. To “lift it up” and expose the lovely peeling stems/trunk you can remove these branches at any time. This also importantly improves air circulation. Make these cuts carefully. Make a cut stand back and evaluate before you make another. The majority of specimens benefit from this treatment in the long run. Use sharp and powerful secateurs as the wood is very strong. To limit the size of a Manzanita see the first method. So- you can limit size and increase density by pruning into green (between leaves). If you prune leafless wood there will be NO re-sprouting from that wood. Its permanent. Avoid amendments, mulch with bark, NOT COMPOST. Mud that splashes on lower leaves in winter/during irrigation can result in black spot (fungal disease) on the lowest leaves. Coarse bark mulch prevents mud splash as well as inhibiting weeds. Newly planted Manzanitas can take weekly irrigation until they begin to grow in earnest- then taper off. Eventually, they are best with no water during the warm months and can handle the driest of years with no visible stress. Manzanitas bloom on wood from the previous year. They may be tip pruned to limit size and as they age they can be limbed up to reveal the striking bark. This also helps ensure good air circulation which they very much appreciate. All are evergreen (of course). We grow Manzanitas in three different sizes. One gallon, two gallon and five gallons. We heartily encourage you to plant in smaller sizes. 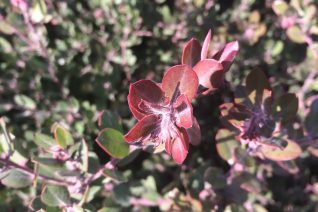 Arctostaphylos especially larger growing varieties grow extremely fast when established. Planting a smaller size not only ensures greater root development it reduces the chances that a young plant is rocked by strong winds which can tear the roots. Starting with a smaller size means plants grow incrementally and the survival rate is much greater. Remember to mulch and then water your manzanita regularly until it starts to grow in earnest. Then taper off. Virtually the same as ‘Warren Roberts’ it is completely interchangeable with that cultivar. Why do we grow ‘Lester’? Aside from having amazing blue foliage and clusters of deep pink flowers from January to March we LOVE Lester Roundtree. She was an amazing, intrepid self-taught botanist who roamed California in the 1930’s in her simple pickup truck camping and botanizing throughout that state. Her seminal book ‘Flowering Shrubs of California’ is a must read for any gardener on the west coast. And its not just about plants- Check it out. This shrub is large in time to about 4′ tall by 8′ wide. The pink flowers born on the blue foliage is a sublime combination. Following bloom new spring growth is a fantastic red/ orange before settling to blue. Bark is a smooth mahogany with time and the trunks are sinuous and winding. This is an excellent shrub in our climate. Once established it requires absolutely no supplemental water- ever. Sailing through temps in the 100’s and bone dry with NO visible signs of stress. Our kind of shrub. It is cold hardy and completely climate adapted. Hell strips, dry borders, informal shrubberies. 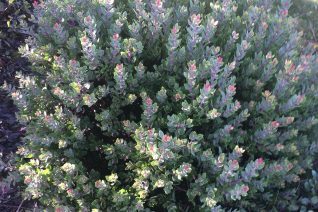 Mix with Ceanothus, Grevilleas, Halimiums. Very pretty year round. 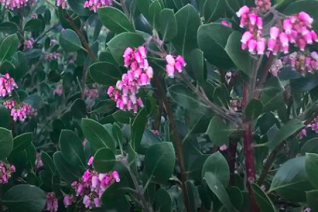 Big beautiful Manzanita that has thrived at our very cold wholesale nursery for almost 20 years and has never been harmed by weather. To 4′ tall and up to 8′ wide the new growth emerges a fiery orange red before settling down to a nice gray/blue. 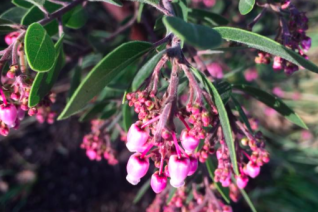 In late winter pink tinted urn shaped flowers decorate the whole shrub. The combination of the blue foliage and strongly pink flowers is magical in winter. Well drained average to poor soil in full sun is ideal but it can get by with less than ideal conditions. Water to establish the first summer then none in subsequent years. Give Warren room- he’s greedy. 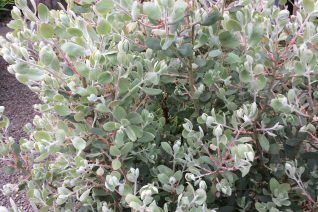 Immensely handsome dense rounded Manzanita that has smaller than average silver foliage and fantastic bark. Moderately fast growing shrub to 6′ tall x 8′ wide in 8 years. In late winter each branch tip is bedecked in clusters of small white flowers- they are born in profusion and expand from pink buds. Russet colored berries often follow and are consumed by wildlife. The black/mahogany glossy bark is beyond striking with the silver foliage. It splits, rolls up into ribbons, and exfoliates in late summer. In time it may be pruned to reveal trunks–for most of its youth they are hidden by dense almost formal looking foliage. Adaptable to many soils including clay soils- especially on slopes. Excellent long term landscape plant that looks great year round. Very good cold hardiness enduring 0ºF with no problem. Dig a hole 3x as big as the rootball in the pot to loosen the soil and allow the new roots to penetrate virgin soil. Water regularly through the first summer- then little to none in subsequent years. Combine with green leaved Arctos for great foliage contrast. Perfect on slopes, areas with intense reflected heat such as parking lot planter islands. Great urban shrub. Appreciates good air circulation. This is probably one of the very best garden manzanitas in general. 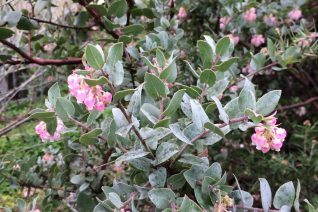 Large growing shrub with sage green foliage, copious, large clusters of pink flowers in winter, and the tell tale famous mahogany peeling bark. To 9′ x 7′ wide in 6 years, fast growing and well adapted to most well drained sites, including heavy clay soils on slopes. Little to no supplemental irrigation. 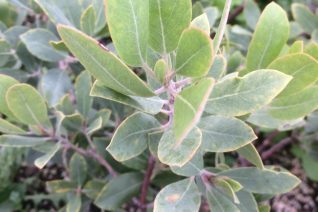 Very resistant to black spot a leaf disease that can afflict Manzanitas. Specimen, or small garden tree. Good looking year round. Flowers appear in late December and are effective through February- not at all affected by cold. Anna’s hummingbirds are immediately in attendance. Provide a wide open exposed site with excellent air circulation. A wonderful garden shrub. 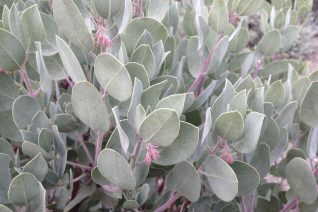 Exceptional low growing Manzanita with new growth emerging electric red and settling to a mature gray/blue. In late winter/early spring copious pale pink flowers appear- very pretty in concert with the vibrant new foliage and older blue leaves. To just 2′ tall by 6′ wide very shortly. Bark is cinnamon colored in time. Full sun and average well drained soil with great air circulation. Little to no summer irrigation. Extremely drought adapted hybrid that many consider to be one of the best. Excellent slope cover. Good appearance at all times. 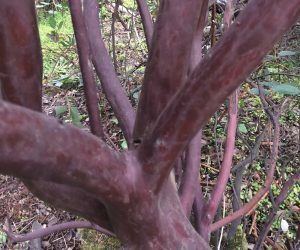 Amazingly showy Manzanita that is a delight when new growth emerges stained in raspberry red before settling to a soft gray mauve mature tone. 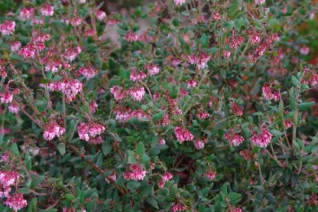 A dense and spreading shrub that always seems to be in growth and therefore never without the colorful foliage. From December to March a non-stop copious display of white tinted pink flowers, in concert with the foliage color its a knockout. To 4′ tall and 8′ wide in 7 years. Best in poor soil or native soil that has NOT been amended. Its an adaptable plant. Let it adapt. No summer water once established. Striking colorful shrub year round. Ground cover, hedges, focal points, blasting hot hellstrips. Anna’s hummers are invariably drawn to this showy winter bloomer. Easy. 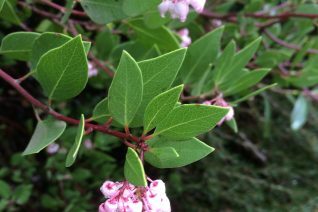 One of the very best landscape shrubs for western Oregon. 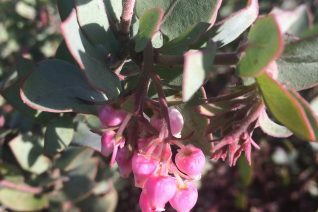 Named for the 50th anniversary of Sunset Magazine way back in 1977- its an excellent, garden tolerant manzanita. Dense growth emerges orange/red before settling to a mature fashionable army green. The stems and leaf margins are outlined in fine white hairs- an elegant detail. In spring sporadic white flowers appear. 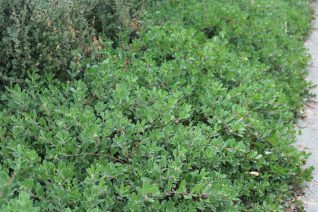 Rounded dense shrub for full sun and average to poor soils, including the most compacted. 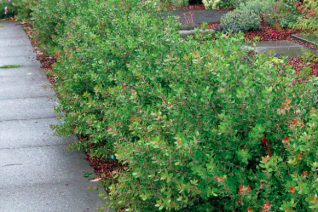 This should be a basic landscape shrub in our climate- To 4′ x 6′ it covers the ground well. A perfect candidate for such places as frying hot circular planters in a sea of asphalt. 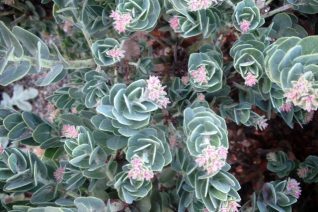 This remarkable shrub will thrive and not flinch without a drop of supplemental irrigation- and it will still always look good. May be tip pruned to encourage density if required. The shredding cinnamon/brown bark is handsome with time but the foliage mostly obscures it. Excellent cold hardiness. 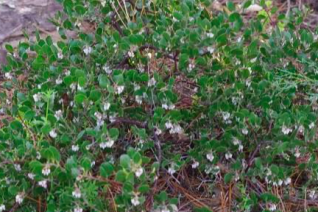 A truly climate adapted shrub. A xera favorite shrub that we’ve grown for close to 20 years. Consistently one of the very best performers in Western Oregon. ‘Sentinel’ accepts many soil types and aspects with superior cold hardiness as well as disease resistance. Fast growing rounded shrub to 7′ x 7′ in 4 years. 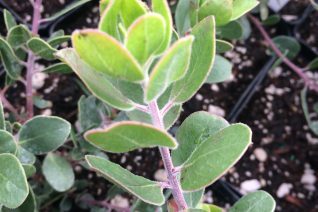 Attractive sage green leaves are held perpendicular to the red stems to avoid moisture loss. The bark exfoliates to a smooth muscular deep mahogany with time. Excellent specimen or even informal hedge row. In late winter deep pink urn shaped flowers appear in clusters and turn to russet fruits consumed by birds. Little to no supplemental water ever. Easy to grow. Provide good air circulation. 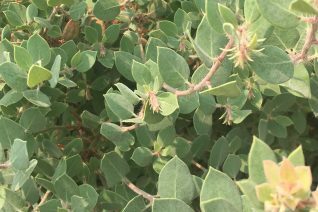 A handsome, easy, and adaptable Manzanita that is a great plant for beginning gardeners. Sharp tipped bright green rounded leaves clothe stems of smooth mahogany/orange. Fast growing evergreen to 7′ x 7′ in 7 years. Average, unimproved soil that has good drainage. Even adaptable to heavy clay soils if strictly unwatered in summer. Urn shaped pink flowers change to white upon opening and draw hummingbirds. The maroon berries that follow are gobbled by birds and seldom spend much time on the shrub. Full sun to light shade and little to NO summer water. Tip prune after blooming to limit size, encourage density. As with all Manzanita it abhors crowding and should be given excellent air circulation. A FANTASTIC Manzanita ‘Howard’ forms an extremely handsome evergreen shrub to 7’ tall and as wide in as many years. Striking mahogany bark is smooth with dark glossy deep green leaves. Profuse clusters of pink urn-shaped flowers appear in late winter and change to white over a period of six weeks. Maroon berries follow in summer. One of the most adaptable to landscapes, tolerates some summer irrigation but absolutely avoid boggy conditions and heat. A fantastic performer in our climate. Excellent as a specimen, basic landscaping shrub, or even informal hedge. Tip prune in summer to limit size and shape if required. Somewhat formal appearance year round. Very nice as an informal hedge and wonderfully adapted to steep slopes. Very good black spot resistance. Verdant and healthy year round. 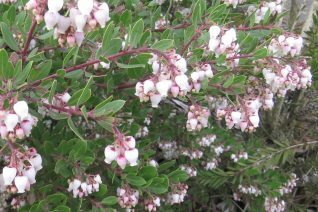 Stellar small scale Manzanita that is a winner in gardens. 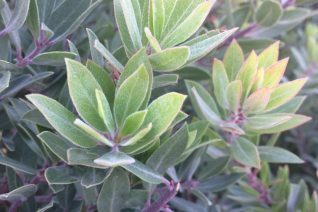 Smaller leaves have a finer texture than most shrub types. Forms a symmetrical, dense dome to 3′ x 5′ in 5 years of medium green foliage. Massive bloom as clusters of white flowers (tinted pink in cold weather) occur from every branch tip in January to March. Very showy russet/mahogany bark. One of the best performers in our climate and scaled well for smaller gardens. Wonderful performance in Hell Strips, even large rock gardens. In time you may remove the lower tired branches that have become shaded out and reveal the smooth spectacular peeling trunks. Little to no summer water. Full sun to very light shade in well drained to average soil. Excellent cold hardiness as well as resistance to black spot. As with all give it good air circulation. Adaptable.